mmsonline.com January 2017 MMS 129 SYSTEMS AND SOFTWARE a common protocol for file transfer. 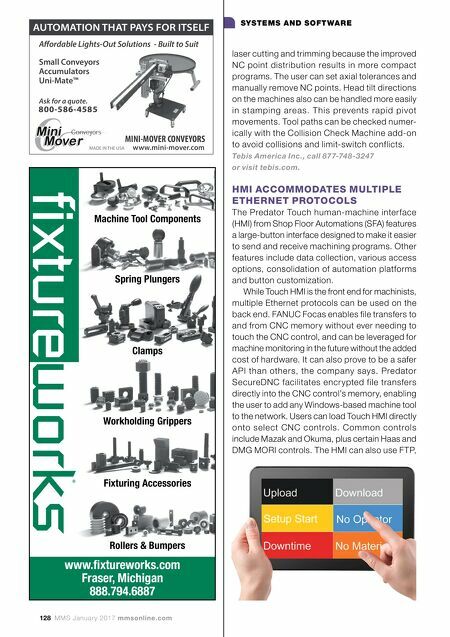 Shop Floor Automations Inc., call 877-611-5825 or visit shopfloorautomations.com. MACHINE MONITORING, SIMULATION SOFTWARE MODULATES FEED RATES ALONG TOOL PATH Industrial Technology Research Institute (ITRI) offers SpeedPro, a software suite designed to improve the safety and productivity of machining operations through machining process simulation and optimization of tool paths, particularly in the aerospace and automotive industries. The software can process programs on machine tools prior to actual machining. It geometrically simulates mate- rial removal and updates part geometry, evaluates machining performance, and displays cutter and machine tool spindle loads. It also optimizes process feed rates to take corrective actions and eliminate machining failures, reduce scrap parts and increase the speed of conservative programs to shor ten cycle times. SpeedPro is installed directly on machine tool controllers and displayed as an option on the machine tool interface. According to ITRI, the software is the first such product incorporating theories of cutting force rather than only considering geometrical preci- sion. The product reduces the trial-and-error to find process parameters and increase overall performance and productivity. The software not only eases the process of finding feasible feed rate values, but also enables cutting force calcu- lations and feed rate value modulations along the tool path. 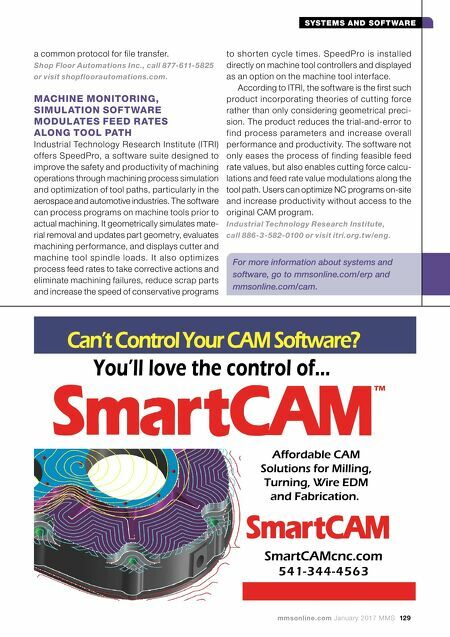 Users can optimize NC programs on-site and increase productivity without access to the original CAM program. Industrial Technology Research Institute, call 886-3-582-0100 or visit itri.org.tw/eng. For more information about systems and software, go to mmsonline.com/erp and mmsonline.com/cam.